Greetings from Sestrière, Italy…wish you were here! 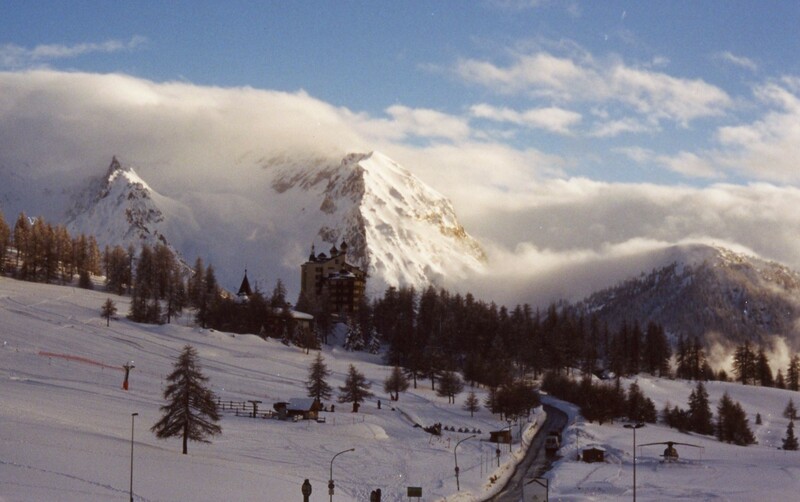 This photo was taken from the ski resort in Sestrière, Italy in 2002. Sestrière lies at the heart of the 249 mile long Via Lattea or “Milky Way” ski area near the border of France and an hour by train or car from Turin, Italy. I had always dreamed of skiing in the Alps. Growing up in Minnesota, I was a diehard skier learning at the young, ripe age of four on the “hills” of the Midwest. Every winter, our family of five were members of the ski club where my parents were instructors and us children were students. We skied through 20 below zero temperatures and even colder wind chills, but never stopped. Eventually we made the fifteen hour road trip to Colorado in our family-mobile, a wood-panel station wagon. We fought the entire way but once we were there, we skied our hearts out. Fast forward to my late twenties and I had the opportunity to go skiing in the Italian Alps with my family. Back in those days, it was actually cheap! I had heard that the ski trails in Europe went for miles and seemed to never stop. After my first run down the mountain in Sestrière I realized it was true. You could ski for hours on end in vast, open pistes. It was a skier’s paradise! When we were ready for a break, we could head over to a mountain-top refugio, take off our skis, kick back and relax outside in a lounge chair basking in the sun like a lizard while delectably drinking a glass of delicious, mouth-watering Italian wine. Skiing the Italian Alps is definitely la dolce vita!